Recently I hear a noise sound at my studio around 10-15 Khz, when I'm using EQ the analyzer show there has a 20Khz "stand noise". How can I find the cause and "kill" the noise sound. I'm using UPS, TV, PC, UR242. Try running the noise through Right Mark Analyser as 16bit .wav. That will give you individual peak frequencies. (I am sure peeps here will know of even better RTA apps now) . Could be the relic "crap 16 bit USB converter noise" . Are you using ASIO drivers and 24 bits? I'm confused here. You have a 15.5dB boost at 14.8k and you're complaining because you have something at 20? What does this look like if you don't have a mad boost there? There may be hums and whines. Track it down like anything else. If you can hear it, then move around til you find the culprit and look at ways of reducing the sound. If you can't hear it and are worrying because you are seeing something on a screen, stop worrying. These days, I high and low pass filter everything on the mix bus anyway, and, looking at your plot, I'd be much more concerned about the low end rumble you have..
Have you tried a different file (maybe from a commercial release)? Just wondering whether this is actually real or a software bug. The 20kHz peak shown is probably just a function of the plug-in display and the maths used. 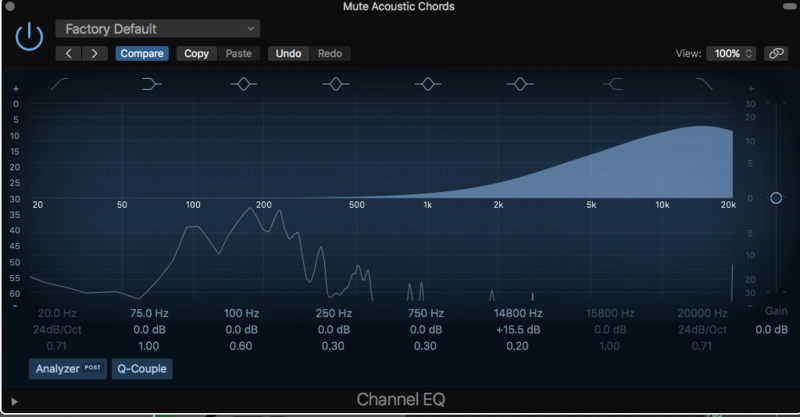 It may even be caused by the big treble EQ boost used. The bass issues Dave mentioned probably don't exits. To get a fast updating frequency display, the sampling period is normally too short to accurately depict the bass end and you get aliasing of the display (not the sound). I'd record some audio, then use an off-line frequency analyser on it. It will give far better results in telling you what you've actually got. Or whilst it's not as pretty, a 1/3 octave bar graph frequency display will give a better indication of the frequencies present than most 'real-time' line displays. This doesn't help you with the high-pitched noise, but it does help to understand that sometimes seeing is not always believing with computer displays. Are you sure about the pitch of the noise you are hearing? Have you compared it to sounds from a sine wave frequency generator to help narrow in on the exact frequency? Unless you have trained yourself to recognise frequencies, it's very easy to assume that sounds are higher pitched than they actually are. aviorrok wrote: Recently I hear a noise sound at my studio around 10-15 Khz, when I'm using EQ the analyzer show there has a 20Khz "stand noise". How can I find the cause and "kill" the noise sound. I'm using UPS, TV, PC, UR242. I'm not clear what the source sound is in your plot above? Is this the output of a microphone recording, or something else? In other words, is the ~20kHz tone from an acoustic source, or something being generated inside the audio equipment itself? Assuming the former, and taking on board all that the others have said about possibly misleading displays etc, I would say that it's not that unusual to have high pitched whistles in studios and control rooms these days. I had hoped they would have gone away after the demise of the cathode-ray tube -- I was very sensitive to the 15.625kHz line whistle of UK TVs... But potential sources now include the power supplies and high-frequency inverters often used in the fluorescent backlighting of computer screens and TVs, as well as line-lump and internal switched-mode power supplies. Inevitably, because they tend to oscillate at such a high frequency (typically 15kHz up to 40kHz or so) they can be very hard to track down with your own ears! However, I have had some success locating elusive HF whistles by using a handheld 'bat detector'. In my case a Ciel CDB101, and although I don't think that model is available any more, there are many other similar affordable devices on the market. These devices use heterodyne technology to pitch-shift ultrasonic sounds down into a more easily audible range. (Bats use ultrasonic clicks and squeaks to echo-locate, of course). 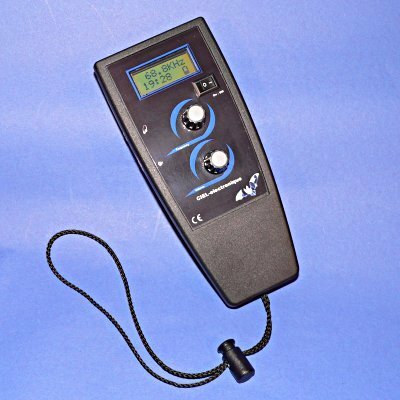 So, by turning the sensitivity down on a suitable bat-detector and moving it slowly around in your control room as you adjust the frequency knob, it is often possible to identify numerous ultrasonic whines and whistles coming from all manner of equipment! Of course, having tracked down any culprits your options are usually pretty limited when it comes to dealing with the noises since replacement of the offending equipment is often not practical. Sometimes re-orientating the device helps as the noise emissions are often quite directional, especially with line-lump PSUs. Alternatively, you can make simple acoustic covers for the relevant items (being aware of any potential heat/fire risks, of course). Given the ultrasonic nature of these sounds, it doesn't take much in the way of a foam-lined baffle to reduce the radiation of unwanted noise dramatically. Hugh, thank you. You've just confirmed something from my youth. That noise drove me absolutely crazy when I was in my early teens, to the point I couldn't bear to be in the same room as the TV (and I knew it was the TV) sometimes. Problem was, nobody else in my family could hear, or 'tune in' to it, leading to many differences of opinion and me being told I was imagining it. Ah! the old "magnetostriction" Hugh! This gave us all sorts of problems with the powerful currents in colour tellies, especially as they went from ply to sub 3mm plastic cabinets. The lady customers, bless 'em were far more bothered than the blokes (I think 15625 had "burned me out" by about 25! But yes, ACOUSTIC radiation. Did not occur to me. I would mainly be looking for electrical coupling. Bass Wonks? What did I say about that? ef37a wrote: Bass Wonks? What did I say about that? Dave B, the other Dave, Dave. You just beat my post* Eddy. All too real Ed' and it is a shame no one believed you because there were things that could be done. Often it was one particular inductor that was the problem and removing it and "potting" it in PVA glue would cut the emission by several dBs. I guess you are too young for 405 line TV? That was 10,125 Hz and MUCH more audible but the cabinets were much more solid and scanning currents much lower. *Doesn't matter. Still being messed about! ef37a wrote: I guess you are too young for 405 line TV? I was the same. And I know my hearing was good because when I was at school I had the record for hearing the highest frequency in the physics class of any previous year (22.5KHz I think). wireman wrote: I was the same. And I know my hearing was good because when I was at school I had the record for hearing the highest frequency in the physics class of any previous year (22.5KHz I think). Is there anyone else who used to notice the 19kHz pilot tone on FM broadcasts? Stereo tuners would filter it out but I had a couple of mono radios that you could hear it on if you listened closely. Yes, in my youth with a few tuners. Can't say I've noticed it in more recent times at all. I'd like to think that's because FM receiver pilot-tone filters have improved... But I fear it's just because my personal bandwidth is diminishing. Ok I try to change everything (cables and microphones) and the noise come from the preamp (WA273) when I record without preamp the noise gone. I connected a TRS cable from audio interface input to WA273 line output it's ok? Today I transferred some tapes recorded at Wessex Sound in the 80's which had a very similar spike around 23kHz - so this sort of thing isn't unknown even in professional studios. I'm just wondering whether the Warm Audio preamp is fussy about output loading - does it expect to see a certain impedance? aviorrok wrote: Ok I try to change everything (cables and microphones) and the noise come from the preamp (WA273) when I record without preamp the noise gone. Okay. Well it's a positive to identify the source of the noise. It's going to be harder to find the cause and cure! It could be a fault in the preamp such as self-oscillation at an ultrasonic frequency. If so, it might change with different gain settings or input selections. Or if you turn down the output fader. Are both channels the same? Or it might be related to a ground-loop problem.